Install approximately 250 feet of pedestrian facilities on Old Union Road to connect the multi-use path along Orleans Boulevard to the sidewalk on Old Union Road, near the intersection with US 42. A dedicated pedestrian facility will complete the connection of existing, dedicated bicycle and pedestrian facilities to US 42. This recommendation would be the first piece of sidewalk proposed on Old Union Road that will ultimately extend south, to the future Union Center development and Union Pool. 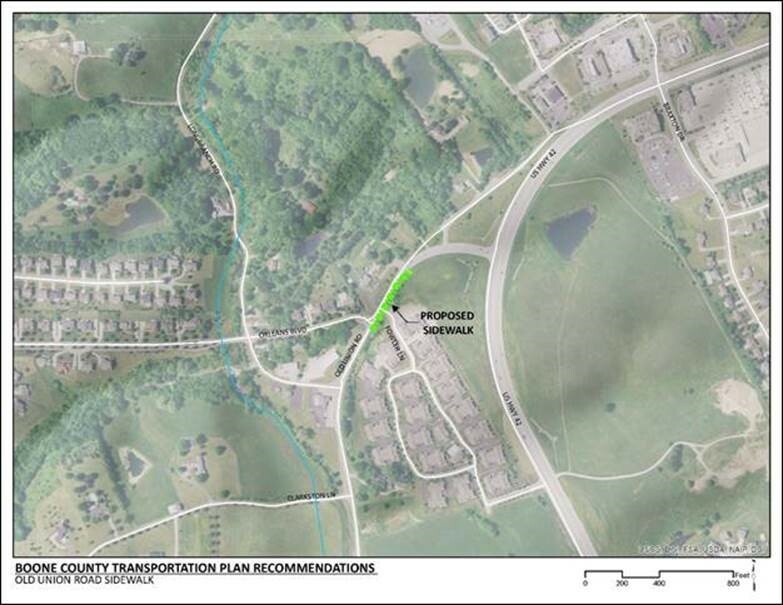 The remaining portion of dedicated bicycle and pedestrian facilities is included in a Boone County Transportation Plan Unscheduled Need project recommendation. This project is consistent with Boone County’s overall goal of improved bicycle and pedestrian connectivity and safety. Click HERE for a map of multi-use paths in Boone County. Acquisition of additional right-of-way may be required to implement the project. Old Union Road within the project are serves a mix of commercial and residential land uses. However, Old Union Road south of the project primarily serves agricultural land use. The 2040 land use map shows a mix of residential and commercial development expected along Old Union Road. This route serves as a primary connection to development on US 42. The Union Center development is proposed south of the project area, near the US 42/KY 536 intersection. By year 2040, population along Old Union Road is expected to increase by over 6,000 households. Pedestrians and bicycles that use the sidewalk and multi-use path must temporarily walk either on the grass or on the roadway. In the five year period from 2012 through 2016, there was one pedestrian crash within this section of Old Union Road. There is an existing multi-use path along Orleans Boulevard. There is also approximately 500 feet of sidewalk along Old Union Road that ties into the existing multi-use path along US 42 and the new Union Marketplace commercial development. A gap of approximately 250 feet is between the existing pedestrian facilities.